Through recognition of those who have demonstrated these characteristics while achieving or developing excellence in the sport as wrestlers, coaches, and contributors. Through recognition of those who have demonstrated these characteristics while achieving excellence in other walks of life after participating in wrestling. Through the maintenance of documentation and memorabilia that depicts and preserves the history of the sport. Through stimulation and encouragement of those who establish and conduct activities at all levels nationwide. Through the development of State Chapters that will continuously strive to enhance the image of the sport of wrestling at the state and national levels. Given in recognition of years of dedication to the development of leadership and citizenship in the youth through the sport of wrestling. Given to former wrestlers who are highly successful and use the disciplines learned in wrestling in their profession. Is presented to a wrestler or former wrestler who has overcome what appear to be insurmountable challenges. National Wrestling Hall of Fame Upstate New York Chapter Class of 2018. 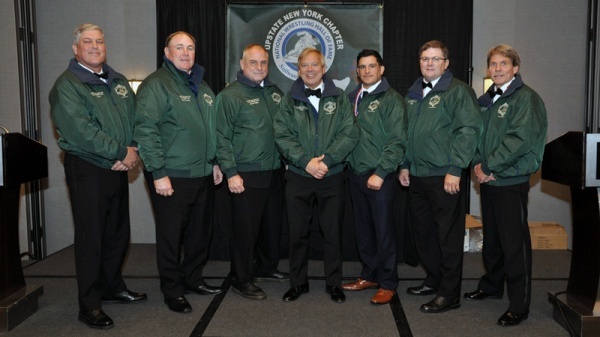 LEFT TO RIGHT: Scott Freischlag, Mike Conners, Mark Faller, Patrick Greene, Frank Mike Hogan, Michael Hogan, Gene Tracy. © 2011 National Wrestling Hall of Fame. All rights reserved.